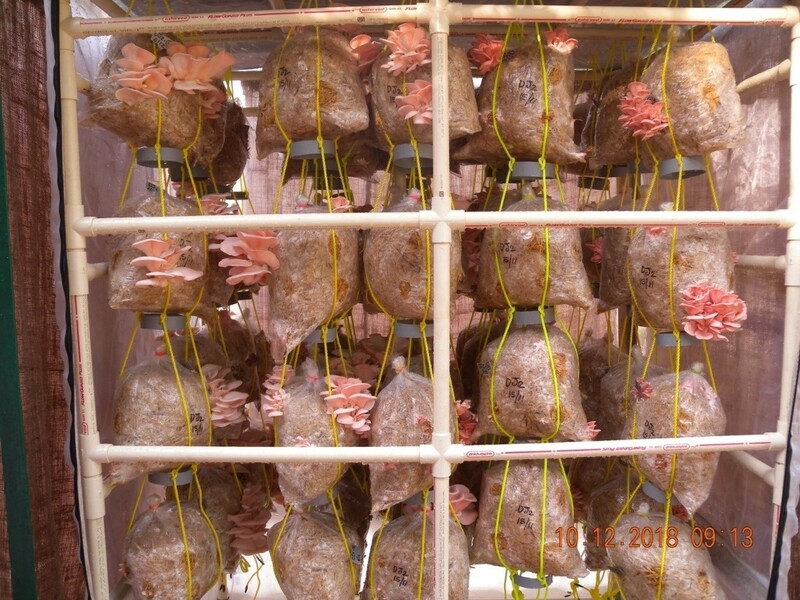 The present technology relates to the production of oyster mushroom by using low cost Solar Power Integrated Outdoor Mushroom Growing Unit which can be at both rural and urban levels. Presently most of the growers are using permanent or semi permanent structures for growing these mushrooms. The newly designed outside mobile chamber is low cost in comparison to the permanent building and even during non favourable conditions like months of April and May, the mobile chamber gives a better environment for mushroom growing due to its evaporative cooling principal as compared to permanent structures. As the availability of the space and capacity of the investment is less, maintenance is easy and less costly for adoption. Such structures will help in developing entrepreneurship not only in mushroom cultivation but also to fabricate and sell the units to the needy growers. It enhances mushroom cultivation to make mushroom as a part of diet. Daily consumption which can help in mitigation of malnutrition and also additional income can be generated for entrepreneurship development especially among women. The overall dimension of the growing chamber is 1.35 x 0.93 x 1.69 m which is made up of 1” CPVC pipes and fittings.It is covered with nylon 40 mesh to protect the entry of insects and to facilitate the aeration.It is further covered with locally available gunny bag all around and it is wetted to maintain humidity inside the chamber. A 30 W DC misting diaphragm pump with 10 nozzles of 0.1 mm size to produce more than 100 bar pressure to get very fine misting inside the chamber. It can be operated either by electric power or using Solar power system with 300 W panel, inverter, 12V storage battery and a timer. The entire growing chamber is fitted inside a mild steel frame of 1.08 x 1.48 x 1.8 (side height)x 2.2 (centre height) with mobile wheels for easy mobility and transport. 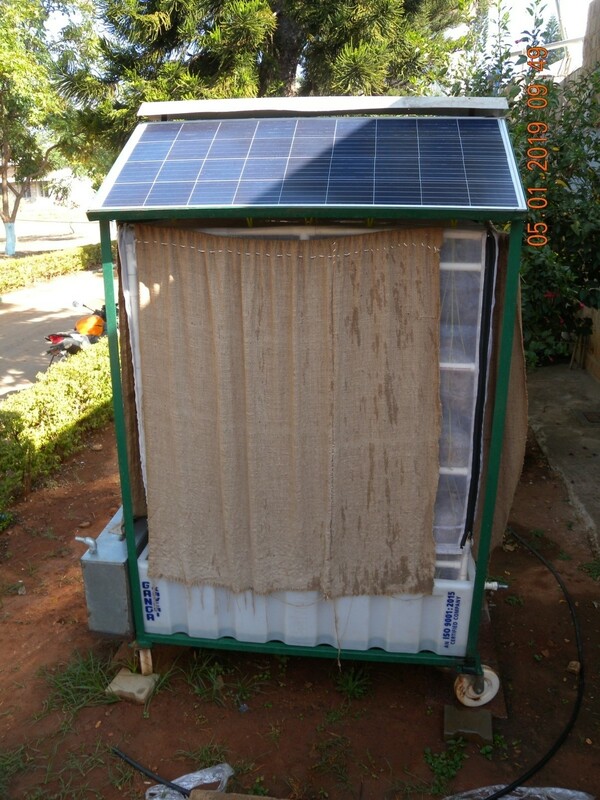 The solar panels are mounted on the roof top of the frame and inverter and battery are mounted and supported in the frame. A 30 litre water tank is fitted at the bottom side of the frame along with the misting pump. It was evaluated by growing two varieties of oyster varieties viz., 20 bags (1 kg) of Elm oyster and White oyster mushroom were evaluated both at cropping room and outside chamber every month from 2016 to 2018. The average yield recorded during 2016 to 2018 shows that there is an average increase of 108 % in Elm oyster yield in mobile chamber in comparison to the cropping room yield. Similarly, an increase of 51% mushroom yield was recorded in white mushroom yield. The average monthly mushroom yield from this structure is 25-28 kg.